I love to make canned goods for friends and this week I learned a new recipe for Rustic Apple Butter. Beth Lord of the lovely shop, indie-pendent in Atlanta has workshops in her upstairs space so when I saw one one on the calendar for Canning & Preserving, I was there with my camera and tripod. Lyn Deardorff instructs the class and she is the mama of canning. With forty years under her belt, Lyn knows the art of preserving inside and out. 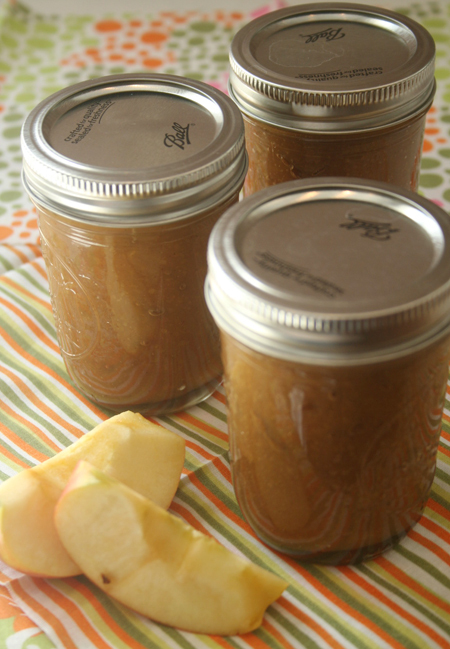 The best part about this Rustic Apple Butter recipe is she leaves the skins on the apples. As she explains, "Peels add flavor, texture and nutrition and the peels also contain pectin which help jams, jellies and butters set during processing." Begin by washing your organic apples and sanitizing your mason jars and lids in boiling water for at minimum, ten minutes. This recipe makes 6 half pints of Apple Butter: 5 pounds juicy organic apples (such as Gala, Winesap, Jonathan, McIntosh or Stayman); 1 cup of water or apple cider; 1 cup (or to taste) sugar (or brown sugar, turbinado sugar or agave syrup); 1 tablespoon ground cinnamon; 1/2 teaspoon ground cloves; 1/2 teaspoon ground nutmeg; 1/2 teaspoon allspice. Wash the apples, remove cores and blemishes and cut into quarters. 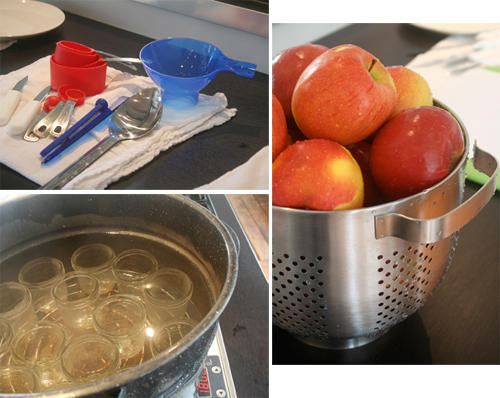 Place the apples and water or cider into a stainless steel or heavy enameled pot. Cook over medium heat until soft enough to puree. Stir occasionally to prevent sticking. Next, place the apples in a food processor or blender (in small batches if necessary) and blend to puree consistency and until the skins are finely ground. Return to kettle and add sugar. Bring to a low boil and continue stirring until the sugar is melted. Next, you can either A) Cook quickly over medium high heat to brisk boil, stirring constantly as apples can burn easily or B) Place in 300 degree oven stirring occasionally to prevent skin from forming on top. 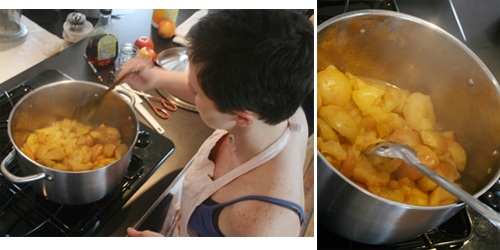 By either method, continue cooking until thickened, so that the puree mounds slightly on a spoon and has a sheen to it. On a candy thermometer, it will be slightly under 220 degrees. 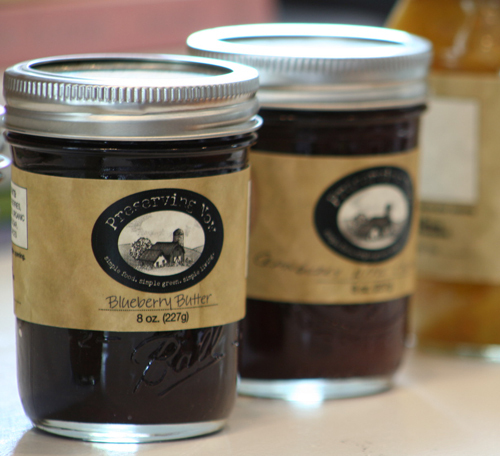 Ladle your apple butter into clean, hot jars leaving 1/4 inch headroom. 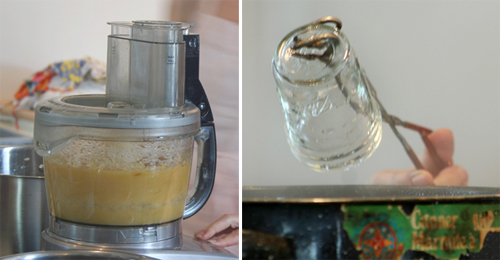 Remove air bubbles, clean jar edges and cap with lids and bands. Process the newly bottled jars in a boiling water bath for 5 minutes. Then remove and cool jars for 24 hours. Store in a cool, dark place.